How to Select Cabinet Hardware | Bow Valley Kitchens Ltd.
Cabinets are no doubt the most visible feature in your kitchen. They dominate the space and dictate the style of the kitchen. 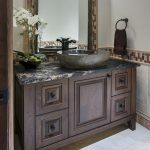 As such, your choice of custom cabinets and their hardware can have a significant impact on the visuals in the kitchen. How do you select cabinet hardware to make your kitchen look contemporary, rustic, modern, or whatever style you want to project? Most kitchens feature both knobs and pulls because the two have their separate advantages. Pulls have always been popular on drawers because they are easier to grip and pull. They are ideal on heavier drawers at the knee level or lower. Knobs are often used on cabinet doors at upper reaches. They are easy to pull even standing on tiptoes. Remember to install knobs or pulls that are proportionate to the doors of the cabinetry. Chrome and brushed nickel finishes are popular in contemporary style cabinets. Brass is a vintage style and is popular in rustic and classic style kitchens. While it is good to colour coordinate finishing with the rest of the décor, there is more flexibility in the choice of hardware finish. Cabinet hardware is more like jewelry accessories in a fashion outfit; it can make the kitchen style loud, subdued or subtle. The good thing is that there are limitless possibilities to try. Your budget will also determine what is and is not possible. It is best to decide on the overall style of the kitchen, then try to match the cabinet hardware to the style. You can try a versatile hardware, for example, bar pulls that works well with a variety of styles. They can be used on shaker cabinets in a traditional style kitchen, and they can also be used on board cabinets in modern style kitchens. If you are going with a casual style, bin drawers are an ideal choice, as are intricate designs for ornate styles, for example, Mediterranean style. Although not much thought is usually given to cabinet hardware, it is very crucial in bringing together the whole visual style of the kitchen. When well selected, the kitchen looks well-thought out, stylish and functional. Are you looking for the perfect cabinet hardware? Contact Bow Valley Kitchens for superbly installed and stylish custom cabinets. Our professional team is ready and willing to listen to your tastes and preferences to help you make a perfect choice. Contact us for a kitchen that will be the envy of your friends and guests.